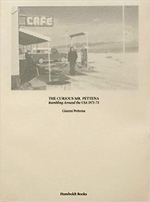 The Curious Mr. Pettena recounts various steps along a journey, through cities and wide open natural spaces, undertaken by the anarchitect Gianni Pettena at the start of the 1970s across the United States. His tour begins with his university experience in Minneapolis, only to become an educational and experiential journey to discover the American landscape, mostly seen from out of a car window. In the years of Land Art and the American architectural avant-garde (with which he had a great deal of direct contact), Pettena looked most of all to the nomadism of American life and society: from the hippie villages of Sausalito to the dwellings of the Acoma and Navajo Native Americans in New Mexico; from the twinkling signage of Las Vegas to the shacks propped up along nameless urban outskirts. Pettena’s imagery emerges from these ‘on the road’ photographs, along Interstate 66: his love for great natural spaces, the freedom of the journey, the shapes of an irregular and anonymous architecture. But above all, like for many young people at the time, there was a tangible desire for a different kind of life.